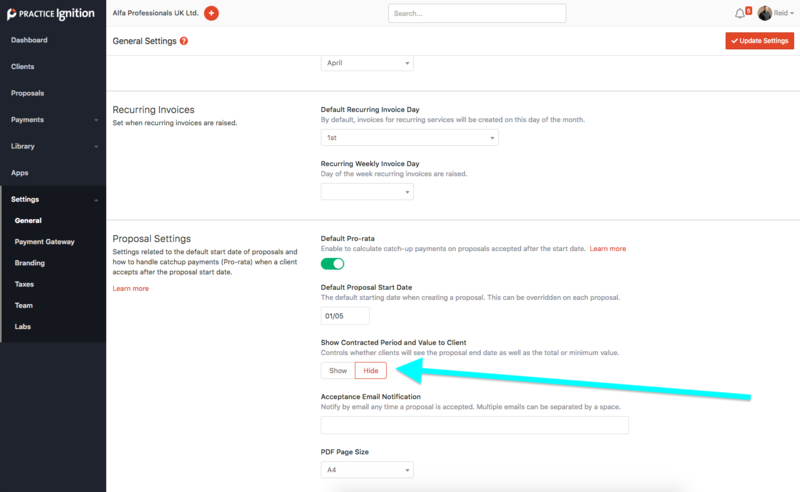 There will be a new option within the proposal editor that will ask you how you would like your recurring services to be billed after the contracted end date. By default, this will be set to continue billing, and regardless of the contracted end date, recurring services will continue to be billed, and the proposal will not automatically be completed. If you prefer to keep the current functionality, you will be able to setup your recurring billing to to stop billing on the end date. How to enable continuous billing? From the left side menu select Settings > Labs > then click on the toggle button to enable continuous billing. Why do I still need to set an end date? Most engagement letters and terms have some reference to a minimum contracted period. The end date gives you the ability to reference a date in your engagement letter using placeholders. End dates are useful when it comes to Workflow - they provide a date in which Practice Ignition can recur jobs from. End dates allow us to calculate a total potential proposal value and surface the data up as projected revenue on your dashboard. The contracted period end date gives you an internal touch point to check in with each client to be sure scope & limitations are still being met, the end date also giving you an opportunity to reach out to offer additional or new services to your clients. Will my clients see the end date? It will depend on your settings. You can either hide the end date from clients, or show it. If you choose to show it, the accept page will display the end date as the "contracted period end date". If you choose to hide the end date, clients won't see any reference to an end date at all. Hide the end date (minimum contracted date) by going to Settings > General > then scroll down to Proposal Settings and select "Hide"
What’s an example of other service providers that have minimum contract dates? Just think of your phone plan...wait no, don’t compare us with telcos 😉. Maybe a better example would be cloud software subscriptions. When you sign up for cloud software you’re expected to meet and pay for the minimum contracted period, whether that be a month, six months or a year, when that initial period is up you’re still billed for the software until you decide to adjust. What does this mean for rollovers and re-engagement? If you are happy with the existing annual re-engagements process where you rollover your active proposals, review, make changes and re-send out for client acceptance, this process will remain the same, and you can get started now! The earlier you get started, the less you need to worry about come year end. Check out this video that goes over our best practices and detailed instructions on how to do a rollover. Can the existing accepted proposal be upgraded? Absolutely! And this presents a huge opportunity to streamline your re-engagement process. From mid May on, you’ll be able to individually or in bulk, select existing accepted proposals and upgrade them so that the recurring services will continue to be billed after the contracted end date. If you’re using Xero Practice Manager any jobs that contain a recurring service will also be upgraded to recur as well. Should I wait or start rollovers now? This may depend on how long the rollover process usually takes you. If this process normally takes awhile and you would like to get started before mid May, then you’re good to go. Go through the normal rollover process, and you can always upgrade the accepted proposal later. If you weren’t planning on starting the rollover process until mid May or June, then we’d recommend waiting until this change is live. From here you will have the (recommended) option of just upgrading your existing proposals and avoiding the rollover process altogether. Or still doing rollovers to review your client offering but you’ll have more control over each proposal’s billing and job settings (if you use XPM). What about my engagement letter and terms of service? Regardless of your chosen path, we see this as an opportunity to review your engagement letter and terms of service to better prepare for continuous recurring billing removing any reference to a contract end date. If you intend to use continuous billing then you will want to think about adding a clause similar to "this agreement is ongoing until either party cancels" to outline the ongoing nature of the engagement. If you need some help editing your engagement letter, you can check out this article here. As always, we’re here to help with making these changes! Best practices and some important details regarding how these changes should be communicated to your clients. You will want to make sure that you communicate with your clients this change during this years renewal and make sure your terms are in up to date so your clients won't be surprised! We recommend using this as your advise client of new proposal template. Keep in mind, this will go to all clients you’re engaging, so it might be good to start with your existing clients and then switch your template back to a more generic email for new clients. Please reach out to [email protected] if you have any questions!